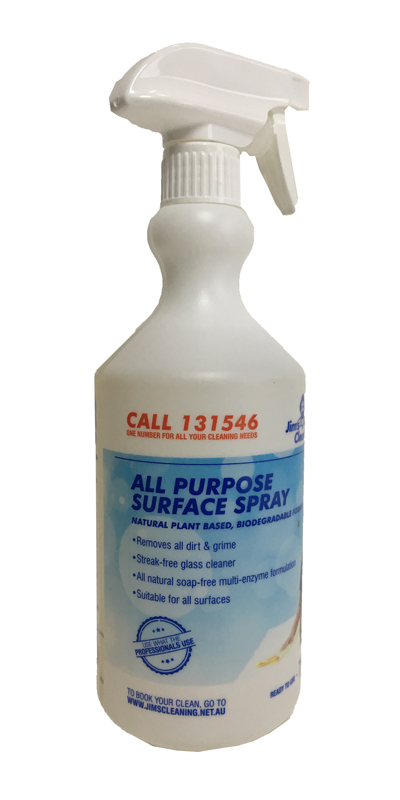 Our All Purpose Surface Spray is apart of our environmental and family friendly enzyme-based cleaning products. This product range is plant derived and 100% chemical free. Perfect for residential and commercial cleaning. Available at Godfreys stores Australia wide. Breaks down fats, oils and grease on all surfaces. Can be used on bench tops, tables, walls and floors. Solution is pH neutral and won’t damage surface as it is neither acidic or alkali. Simply Spray affected areas with Jim’s Own All Purpose Surface Spray, wipe down with clean cloth for a spotless clean. For heavily soiled areas, spray surface. Wait 2-5 minutes for enzymes to break down fats, oils and greases. Wipe down with clean cloth. My windows have bars on the inside but Daniel managed to clean them perfectly. Very friendly & excellent service. Very reasonable rates. Would highly recommend Jims cleaning. Dilanka's car detailing service was great. My car was very dirty inside as we have been renovating and it had been used extensively to cart rubbish, etc. around. My car is now very clean and I feel happy and calm driving it. Terence arrived on time and cleaned our venetians with minimal fuss. He did an excellent job with the blinds - they are eight years old and now look brand new. Terence was very professional and I have already recommended him to our neighbour. I will definitely use his services again in the future. I was impressed with how quickly he contacted me after I had placed an initial enquiry. Terence is an asset to Jim's Cleaning Group.